The LG Direct Drive F1496AD5 Freestanding Washer Dryer has a condenser dryer, many customers found it awkward to open the door to check the drying status once the programme was running, it seems to take up to 3 hours to dry a full load and 2 half hours for a heavy wash. On th e plus side though it is possible to set the washer to a 30 minute quick wash and the dryer for less time also. the washer/dryer has an 8 kg drum, large enough for a duvet or 40 tee shirts. Customers said the drying facility was superb, the dryer worked really well. It dries 4 kg of clothes. 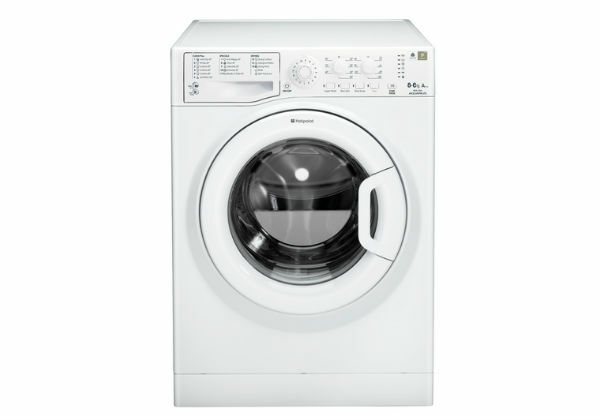 It is a pricier machine and as such is extremely well built, it has a tough wide opening door and durable fittings. It has a child lock on the control panel as well as a tamper proof lock on the door. The control panel is buttons and a dial with LED display, the display has a countdown facility so you can use your time efficiently. It has 13 programme which include a gentle baby cycle and at the other end of the spectrum an intensive sports cycle., a woollen cycle, cottons , pre wash, rinse hold, and a steep for stubborn marks. it also has a 19 hour delay timer so you can set the machine to switch on when you want it to. The LG Direct Drive F1496AD5 Freestanding Washer Dryer has energy effieciency rating B and costs £45 a year to run for washing and spinnin and £200 a year for was hing and drying. The dryer has sensors which stop the machine once your fabrics are dry. It will fit snugly under most kitchen counters, the dimensions are 85 x 55 x 65cm. The LG has an extra large porthole and variable temperature and spin settings. The drum revolves at 1400 rpm making drying quicker. It has an automatic anti crease action which cuts down on your ironing. This LG has a medic rinse programme which will steralise clothes and get rid of any allergens. The LG Direct Drive F1496AD5 Freestanding Washer Dryer is cold only fill meaning only the amount of water neccesary is used. It uses fuzzy logic which reduces the amount of water needed to only that strictly neccesary by way of sensors in the machine. It has an A rating for washing and for drying performance. The LG comes with a 2 year manufacturers warranty.